ASIC v Geary | Fraud charges – appeal dismissed with costs. The Court of Appeal has cleared Peter Geary of fraud charges dismissing the appeal lodged by the Australian Securities and Investments Commission (‘ASIC’). Summary of the Court of Appeal’s judgment delivered on 23 April 2018. The Court of Appeal (Ferguson CJ, Weinberg JA and Sifris AJA) today dismissed an appeal brought by ASIC against a former officer of Australian Wheat Board Limited (‘AWB’), Peter Geary. In 2015, ASIC brought what are known as ‘civil penalty proceedings’ against Geary, as well as another former officer of AWB, Trevor Flugge, for alleged breaches of their duties under ss 180 (care and diligence) and 181 (good faith) of the Corporations Act 2001 (Cth) (‘the Act’). While Flugge was found to be liable for having breached his duty to exercise reasonable care and diligence, the trial judge held that, on the evidence, the allegations against Geary were not made out. ASIC sought leave to appeal against that finding. The breaches of the Act were said to have arisen out of various payments made by AWB to Iraq between 1999 and 2003, which were contrary to UN Resolutions. Hard currencies were transferred to Iraq (a) under the guise of sham ‘inland transport fees’, (b) as compensation for purportedly contaminated wheat, and (c) by way of inflated wheat prices to pay a debt owing to a third party. AWB would then recover the payments from a UN Escrow Account by reason of having supplied ‘humanitarian goods’ to Iraq. ASIC alleged that because of his position within AWB, Geary knew, or ought to have known, of this improper conduct. Moreover, ASIC alleged that he breached his statutory duties by failing to inquire into, and prevent, such conduct, knowing that its public revelation was likely to cause substantial and enduring harm to AWB. Geary’s case in response was, in short, that he reasonably believed that the payments had been approved by both the Department of Foreign Affairs and Trade (DFAT) and the UN. In the case of the compensation for purportedly contaminated wheat, Geary’s case was that he believed that legal advice had been obtained to the effect that these payments were lawful. The trial judge found that it was the prevailing view within AWB, at least with respect to the inland transport fees, that the payments had been approved by DFAT and the UN. In considering the application for leave to appeal, the Court of Appeal conducted what it described as a ‘real review’ of the evidence led at trial, and the numerous findings of fact made at first instance. This was no easy task, the Court noted, given that the transcript of the trial ran for some 3000 pages, and the trial judge’s reasons extended over nearly 800 pages. ASIC’s case was based substantially upon inferences sought to be drawn from the more than 1,300 documents, that were included in the many exhibits tendered in evidence. The Court of Appeal concluded that the findings of the trial judge with respect to Geary had not been shown to be erroneous. These included the finding that there was, at the relevant time, a prevailing view within AWB, shared by Geary, that the inland transport fee had been approved by both DFAT and the UN. Ultimately, the Court of Appeal held that ASIC had failed to establish that Geary had breached his duties under either s 180 or s 181 of the Act. 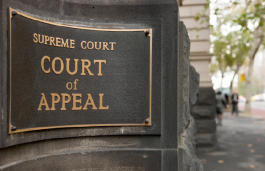 Although ASIC was granted leave to appeal, its appeal was dismissed.